Emma is one of our qualified nurses. She joined Boness Vets in 2013 after studying at the Royal Veterinary College. 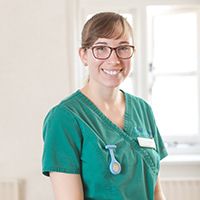 She enjoys all aspects of Veterinary Nursing, with a particular interest in cats, and is currently progressing through a diploma in feline nursing. Emma is also part of the cat friendly clinic team. Emma loves to spend time with her horse, Harvey and they both compete locally at dressage. She has just taken on two kittens that will no doubt get up to lots of mischief!